Just yesterday I was pleasantly surprised by a Midtown Starbucks on 53rd & Lexington that was both welcoming and spacious. 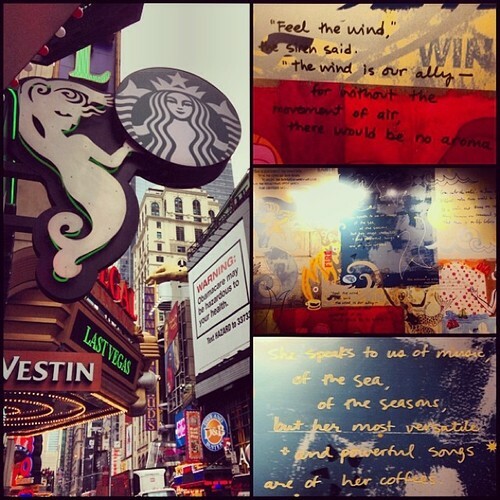 Today, I’m thrown deeper into bewilderment as I sit at a Time Square Starbucks that is neither crowded nor small. The Starbucks on the corner of 45th and Broadway is just a few steps away from what is arguably the heaviest tourist crowd in the country, yet sitting inside you would never suspect it. Sure, the crowd ebbs and flows, but there always seems to be an available chair or two. There’s even a set of comfy chairs in the front seating area. 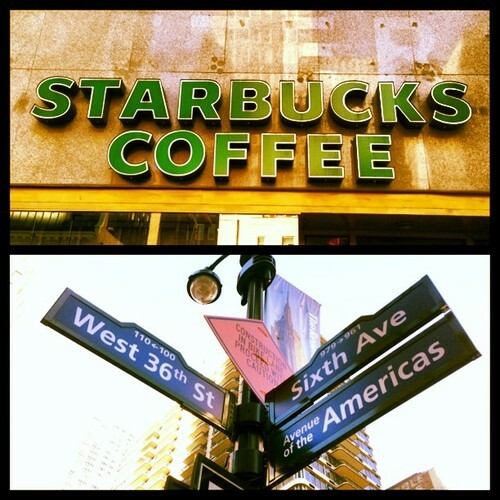 My only theory is that this Starbucks is protected by the fact that it is on 45th and not Broadway itself. Most caffeine craving sightseers simply never hear the siren’s call. I could spend more time theorizing over why this Starbucks is the way it is. But I’d rather just take some time to enjoy it while I sip my Chocolate Chai Tea Latte. By now I’ve visited Starbucks within banks, Starbucks in business lobbys, Starbucks in airports, and Starbucks in retail stores. 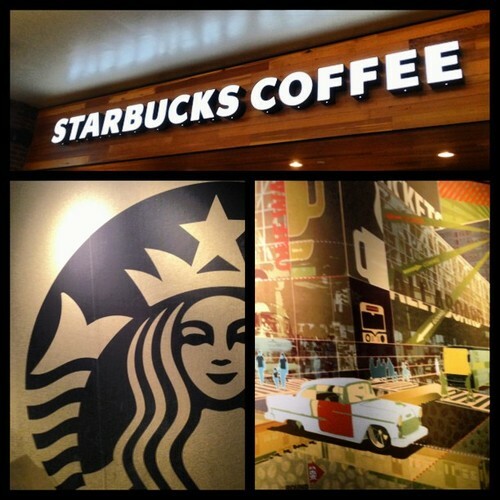 And today I add one more type of Starbucks to my hitlist: a Starbucks in a bus station. Not just any station though, this Starbucks is the latest addition to the giant Port Authority Bus Terminal in Midtown between 4oth and 41st street on 8th avenue. 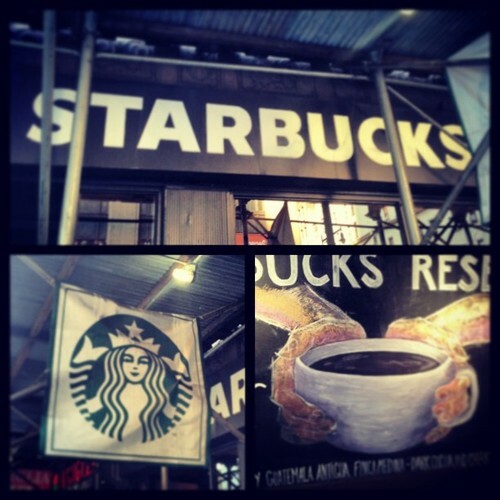 This Starbucks is one of the newest additions to the 200 plus locations on the island of Manhattan and wasn’t here when I started this blog over six months ago. Unfortunately, that means it wasn’t hear a few years ago when I first visited Manhattan and ran through this labyrinth of a bus terminal in search of a friend who had taken a bus into the city. If it had been here, then the terminal may have been a little more welcoming. As it is, this Starbucks is on the main concourse level of the bus terminal and is only a couple of yards from the exit onto 8th avenue and cab service. According to a New York Times article (whose headquarters is conveniently located across the street) around 250,000 people pass through this terminal each day, and I’ll bet half stop at this Starbucks. So of course, there is no need for a doorway or wall to limit traffic; the Starbucks simply opens up into the terminal, and the distinction between cafe and bus station rests in floor tiles, music (jazz, currently) and aroma. The Starbucks does gather quite the crowd, but my hat goes off to the baristas who try to stay on top of who’s sitting here enjoying a coffee and who’s just looking to loaf. 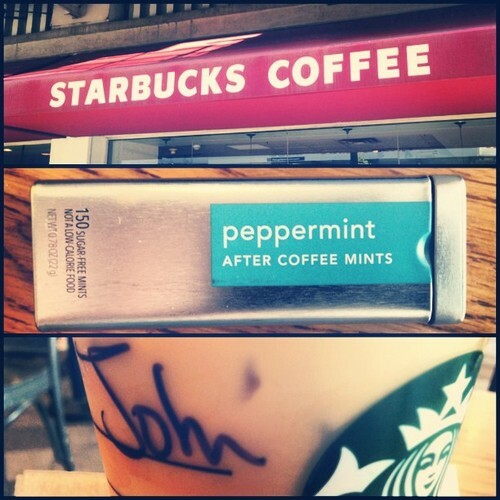 Would I recommend this Starbucks as a “Go-To Starbucks” to catch up with a friend over coffee? No… But it certainly is convenient for tired travelers in and out of NYC. 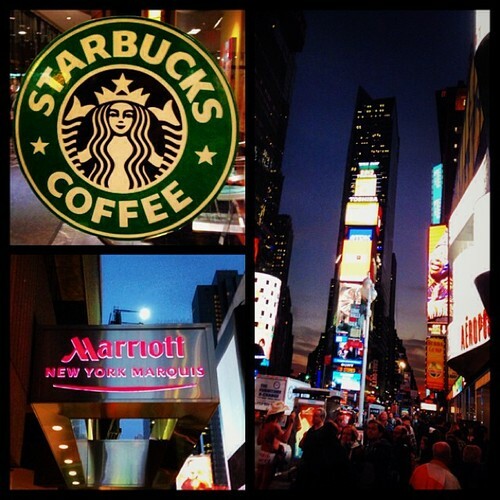 Finding a large Starbucks, equipped with plenty of seating and space to spread out, in Manhattan is rare. 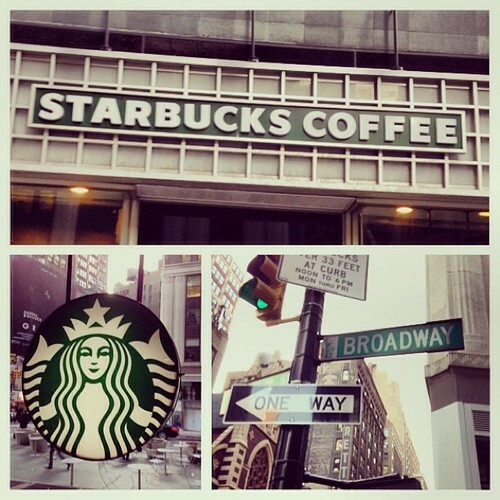 But finding one in Midtown, Manhattan can seem like playing the lottery and winning the jackpot. Anyone else go in for the 600 mill last week? This guy did! I bought my first lottery ticket ever, and no numbers matched in any of the positions. It was like I drew the inverse of the winning ticket, and it made it seem like I should owe money instead of win any. This Starbucks on 51st & Broadway is unique not only in its large size, but it also has a faded red awning that surrounds the building instead of the typical green or black ones. Inside, there are two seating areas, two bathrooms, and a barista bar equipped with the Clover — for those of you who like their coffee freshly pressed. While it is not in the heart of Times Square, it is only four blocks north and is still surrounded by theaters and congesting groups of tourists. Lots of hotels also exist in this area just north of the Square. This location may not be the best in the city. But when it comes to the Theatre District, it’s certainly the best I’ve seen so far. You can tell it warmed up in the month of April just by looking above and seeing iced coffees and teas in most of my photos. This month I reached a total of 14 unique Starbucks locations throughout Manhattan in 9 different neighborhoods. 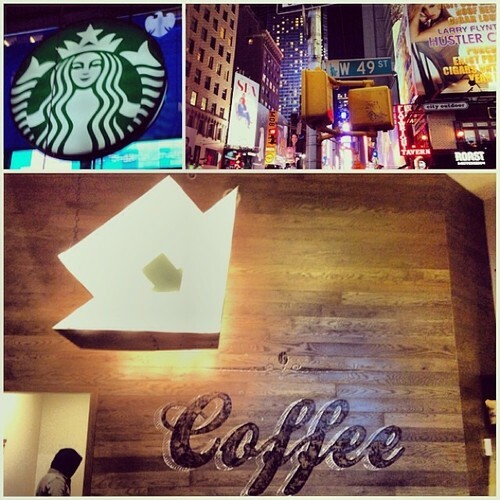 However, because of sheer density alone, most of the Starbucks I visited this month were in Midtown. Which makes sense, because if I had to give a rough estimate, I’d say 50-60% of the Manhattan locations belong to this large neighborhood. 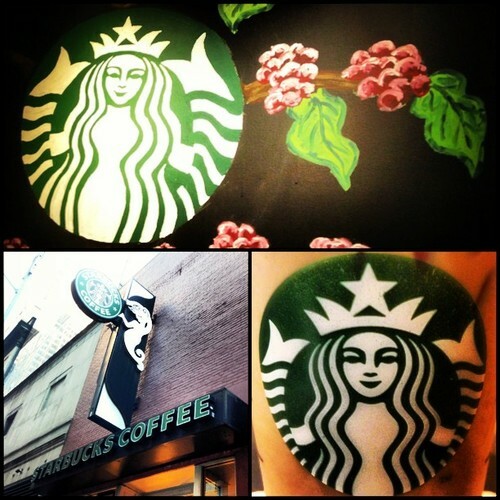 This month I got the pleasure of visiting the one and only Starbucks located in the Lower East Side. But the most impressive Starbucks I came across in April has to be the Greenwich and 8th location. The swanky decor and plate glass walls made this one of the most aesthetically appealing locations I’ve seen on my journey. Unfortunately, this month I’ve encountered no 5-Cup locations, while I did stumble across two 1-Cup locations I’d recommend in a caffeine emergency only — both in the center of midtown on 42nd & 43rd street. With a third of the year already spent. My plan is to kick it into high gear over the some. I’ll be searching for new neighborhoods and new drink combinations. Any tips would be greatly appreciated.